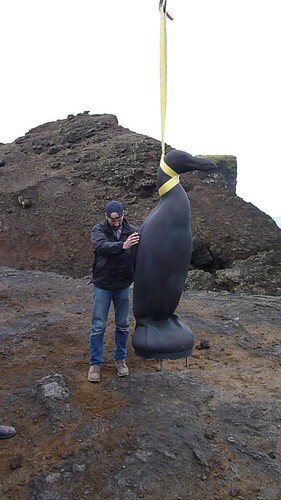 We had alloted ourselves three and a half days to install the Great Auk on the edge of Islandia. We got an early start in the whipping wind and off and on drizzle. 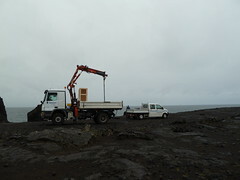 Our wonderful hosts had supplied us with a crane truck and two amazing workers. They were, what I'm finding out, very typical old school Icelanders. Quiet, older gentleman, who had lived their entire lives in Reykjanesbær, a small coastal town, 40 minutes from the capital. Hard working and appreciative of where they were and what we were doing. We set to work and things just fell into place. Every step happening just as it should. 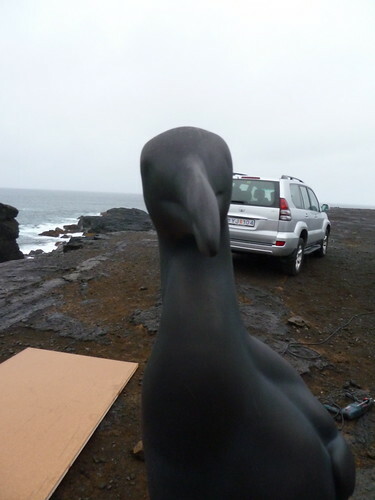 We first unloaded and unpacked the beloved Auk. 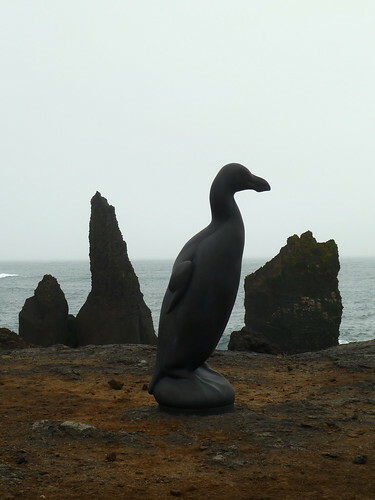 The next step was grinding the base to fit the landscape and positioning Auk-Auk so she could look out across the North Sea at Eldey Island. 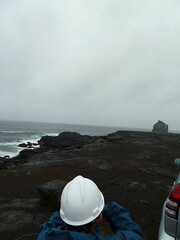 Of course at that moment the clouds obscured the island and we became quite vigil in locating the large rock. Her gaze must be exact. Finally one of the Icelanders anounced "Their she blows." And we found our bearings and her postition. Grinding ensued. 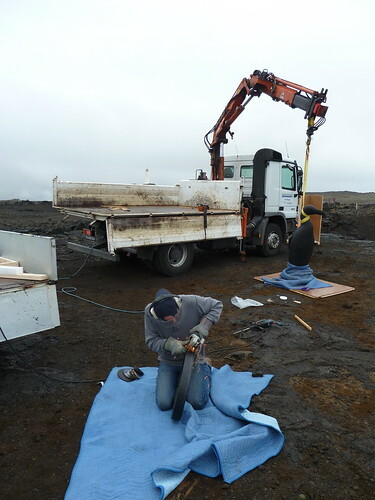 Todd's masterful hand created a perfect base and then holes were drilled into the rock and filled with epoxy. 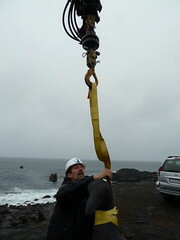 Rods were attached to the bottom and she was put into place. It was truly a magical moment. 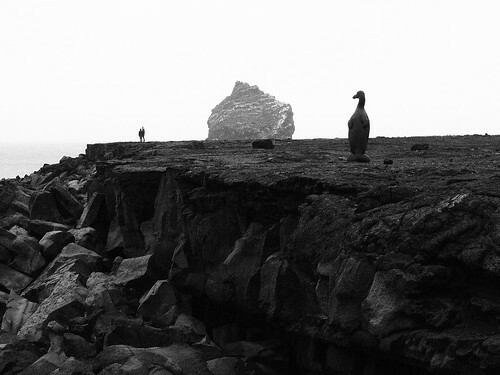 Too bad only the Auk can see the island out in the fog. We gave ourselves three and a half days and were done in three and a half hours. 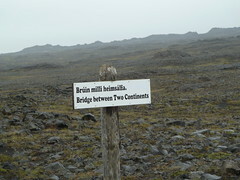 The rest of the day was spent exploring the surreal landscape, bird watching and visiting the "Bridge Between Two Continents" (tell you about it later). There was also some local beer involved. 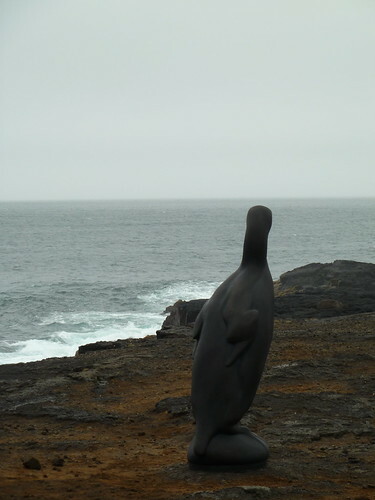 It is a beauty to behold, this sculpture, out on a corner of the world rarely visited by anyone. She fits into the landscape and longs for the sea. 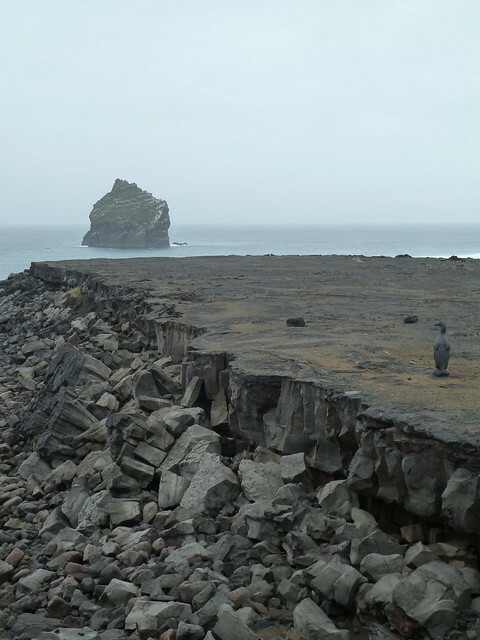 The lava rock is barren and lonely and the North Sea is relentless, pounding harder and colder than the wind that kept us chilled long after we had climbed back into the Land Crusher. Tomorrow holds another adventure, wait till you see.